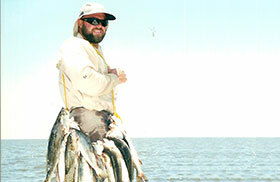 Speckled Trout Fishing Charters At Bayou Log Cabins Fishing Lodge. 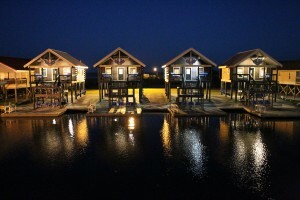 This has been a jam pack weekend here at Bayou Log Cabins Fishing Lodge. 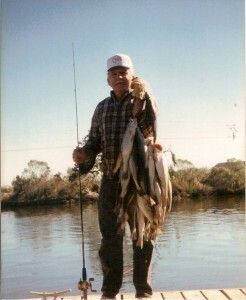 We had all four log cabins rented out to folks from three different states and the weather was just right for fishing. The wind had been laid down early in the morning and as the day went on the breeze would pick up making it bearable with the elevated temperatures we been having. Anyhow with the light winds we been having early in the morning, that makes for some good speckled trout fishing on the south side of Barataria Bay near the barrier islands. 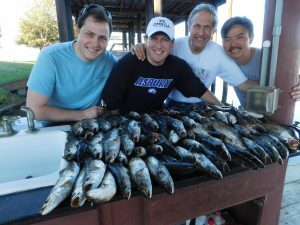 Of course, we have been catching some pretty trout on the oyster reefs in about four feet of water. The water has cleaned up a little bit over the last week and the fish are hungry. I picked up a family from the cabins Saturday morning and headed south across Barataria Bay with a light wind out of the northwest. The sun rise was fantastic Saturday morning while crossing the bay. 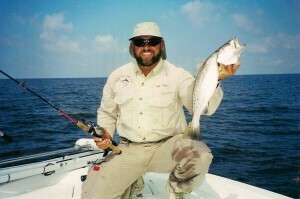 The birds were diving in many locations but we keep going across the bay because we been catching some nice trout near the four-bayou pass area. Saturday mornings are a little hard to fish with all the nice weather we been having. The kids are out of school and it seems like there are a lot of families on the water. That is a good thing, however you must get to your best spot early in the morning because if you don’t, it might not be available when you arrive. 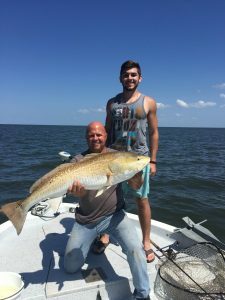 With the water clarity being much better this weekend and the water temperature rising to near ninety degrees, this is what I call the best time of the summer if you can take the heat. It is an early morning bite so you must get up and get out there right at daylight. By eight thirty yesterday morning we had our fish on ice and took advantage of the opportunity to ride around and do some looking around. 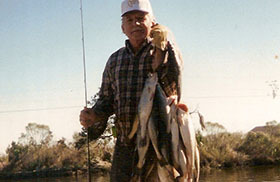 There were plenty of birds working the bait and seem to have speckled trout feeding at several locations, but like I said you must be out there early in the morning. By ten o’clock in the morning we did not see anyone’s pole bent. It seems as through someone simply flipped the switch on feeding time. We stopped over at the sand dollar mariner for a shrimp sandwich and a cold drink and then started working our way back across Barataria Bay towards the cabins. It was a nice ride coming back. We pass by Queen Bess island so the kids could see all the diverse types of water fowl that lives on that island. They said they wanted to see somethings that they could right about when they went back to school because the teachers are always asking them to write essays about things they did over the summer. 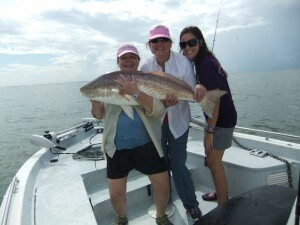 Well not only did we catch a box of speckled trout and two very nice bull reds, Queen Bess Island was on the way home. We did a little bit of island hoping on the way home but the morning bite was over with. You could tell because on the way home all the places we say the birds working on the way out, nothing was going on at those places while on the way back home. Funny how you can travel the same path at two various times of the day and have a totally unique experience regarding what you see. For all the people that get up at eight o’clock in the morning and travel to the local marina put their boat over in the water then load up the ice and live shrimp then leave the dock at ten o’clock, I can tell you that you are missing out on the best time of the day. When we got back to the cabins two of the guys helped me clean the fish and then we iced them down good in their ice chest for the ride home. You hear me say all the time that building memories while on the water with your family is one of the most important things you can do during the fair-weather months of the year. Try and not take you family out on a fishing trip when the weather is too hot or too cold. Having an enjoyable time on the water can be largely determined by two things, how many fishing they catch and how nice of a day it was. I know one thing for sure, those two kids on the boat yesterday will have a lot to wright about this year when they go back to school. 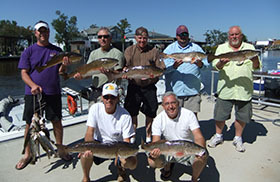 They each caught a huge bull red while catching many of the speckled tout. 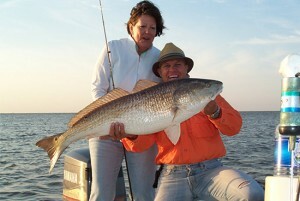 At the end of the day I think they enjoyed catching the bull reds more than anything. Funny how that is because after a quick photo session with those big bull reds I threw them back over so someone could fight them another day. As you well know they are too big to try and eat as the two slabs of meat that you get off one of them is too thick to really do anything with. Saturday afternoon after the sun went down a little bit the entire family got in the back yard of the cabins and was playing a game that seem to be a lot of fun. They set up two boards about ten feet apart and was throwing small rings from one board to the other. The object was to see if you could hook the rings around a spike coming out of the other board about ten feet away. They had lots of fun both fishing them speckled trout as well as playing that game. 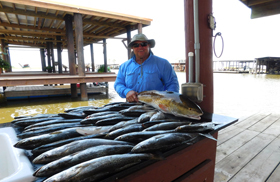 Just another great weekend here at Bayou Log Cabins Fishing Lodge. Until next week always be safe on the water and watch out for any severe weather that might pop up. 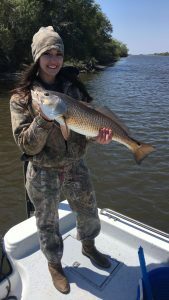 Her First Saltwater Red Fish.